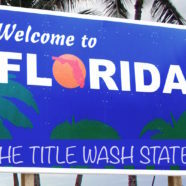 There is a scam going on in Florida where the Florida warehouse lien law is being used to wash titles. The lienholder receives a notice saying that a vehicle has been held in a warehouse and will be sold unless the fees are paid. These fees are typically only a few thousand dollars (so the problem does not seem severe). When the lienholder calls the warehouse company to make arrangements to pay the fees and pick up the vehicle, the lienholder is told that the customer has already paid the fees and redeemed the vehicle. The lienholder thinks the problem is solved. Guess what happens next? The warehouse company completes its “auction” and then submits an application to take title to the vehicle free and clear of all liens claiming that the lienholder did not oppose the auction. By the time the lien holder realizes that its lien has been washed the vehicle is long gone. Lienholders who experience this situation can request a 30-day freeze of title with the Florida Department of Highway Safety and Motor Vehicles which will provide time to verify the supposed redemption with the customer. However, if the account is not current, it is wise for the lienholder to immediately file suit to stop the title washing process. The New York City Taxi & Limo Commission (TLC) seizes vehicles that are used as illegal taxis. Recovering a vehicle from the TLC is a two step process. First, the TLC can only release a vehicle to the titled owner. For lienholders, this means that you must obtain a court order declaring that your lien gives you the rights of a titled owner. Do not attempt to use a “repo title” as it is illegal to request it because the lienholder does not have actual physical possession of the vehicle. Obtaining the court order is not difficult, but it takes time so the process should be started early. With proof of ownership rights and payment of a $750 fee, the TLC will issue a release. The second step is to pick up the vehicle from the private towing company that is holding the vehicle for the TLC. The tow yards attempt to charge a daily storage fee but these fees can be negotiated down to a reasonable amount. Suppose you receive a notice from a garage which states that the garage has towed a vehicle at the request of police and that there’s a daily storage fee. You call the garage and offer to pay the fees. The garage tells you that it cannot release the vehicle until the police hold is lifted. What do you do to get the car out and prevent storage fees from piling up? You must immediately file a court proceeding under the New York Lien Law to stop the fees and pick up the vehicle. Lienholders and leasing companies who do not act quickly to challenge the storage lien may be charged for months of storage fees which could otherwise have been avoided. So, the rule to remember is to challenge storage fee liens on police impounds without delay. Nassau County is the only county in the nation that files a formal forfeiture lawsuit with every misdemeanor DWI impound. The county sues the driver/offender and the owner and lienholder listed on the title. However, in many instances the impounded vehicle is released to the owner before the forfeiture lawsuit is concluded. This has led to a great deal of confusion. I’ve listed the three most common questions we are asked and the responses. Question 1: Does the lienholder/leasing company have to respond to the forfeiture lawsuit if the customer takes back the car? Yes, the lienholder/lessor has been sued in the Supreme Court. Failure to respond is a default. The County has been taking default judgments against lienholders, which gives the County title to the vehicle free and clear. Lienholder/lessors should never default. Question 2: If the customer has the car back, does that mean the lawsuit is over? No, cars are released for many reasons while lawsuits are ongoing. One of the most common reasons is that owners are allowed to retake a vehicle if they post a bond with the County. However, the County’s lawsuit is not over until a discontinuance of the lawsuit is filed. Question 3: What happens if a customer wants to return a vehicle to the lienholder/lessor while the lawsuit is open? The lienholder/lessor can take the car back but cannot sell it without getting permission to do so from the County. The reason is that the County has sued the lienholder/lessor and the County law requires County permission before any vehicle is disposed of. Failure to notify the County allows the County to seek damages in the amount of the vehicle value, plus $1,500. Lienholders have the right to demand insurance proceeds when an insurance company refuses to pay for a vehicle loss. This is true even if the lienholder is not the loss payee on the policy. (In re: Holtslander, Case: 13-60083, NDNY, 3-20-14) In M&T Bank v. Geico, the insurance company refused to pay the owner for a stolen car claiming that the circumstances were “suspicious”. The lienholder then filed suit and the court ruled that in order to deny the claim the insurance company would have to present facts showing misconduct by the owner. Since all the insurance company had was suspicion and speculation, the insurance company had to pay the value of the vehicle to the lienholder. The facts are indeed suspicious in many vehicle loss cases. Lienholders and leasing companies shouldn’t just walk away from a potential recovery simply because the insurance company denied the customer claim. The Port Authority of NY-NJ manages the LaGuardia and JFK airports and seizes vehicles that are used illegally at the airports. The Port Authority attempts to charge storage fees of $100 per day from the date of seizure. However, the law states that the Port Authority cannot charge storage fees until it has sent a notice to the lienholder or leasing company by certified mail with return receipt requested. You can save thousands of dollars in improper storage fees just by knowing this rule.